You’ve been anxiously anticipating the first day of deer hunting season; the time of year when the bucks let their guards down and the hunters pick up their rifles. Knocking down a trophy is challenging, and making rookie errors will only make it that much harder to hit your target. If you’re a hunting newbie, you’ve probably landed on this page to learn how to avoid some of the most common deer hunting mistakes. Only experienced hunters can pass on their years of wisdom, which is why Nine Bar Ranch is here to help you. One of the top secrets to a successful hunting escapade is stealth. Many hunters scare away any deer by moving around too much. Even if you can’t visibly see a deer, it doesn’t mean that it’s safe to wiggle around or fidget in your tree stand. Here’s the thing: deer will almost always spot you before you will spot them. Too many hunters lose their focus, make noise, and lose a target before it’s even in their sights. NOTE: Banging a rifle against a tree or clanking an accessory against the tree stand is a warning alarm for any deer. Many hunters are “call happy” which will quickly drive deer out of the area. Our tip is to only call if you physically see a buck, but he’s not moving in your direction. You’re not going to lose anything by doing this; making an appropriate call at a time like this can lure a buck closer to you. Calling blind doesn’t always work. Your hunting experience won’t look the same as what you may have seen on popular hunting shows on tv. On the other hand, if a deer is coming towards you, don’t make a single sound. If he changes directions and begins to walk away from you – try calling him. Your best bet is to err on the side of less calling. It’s easy to get out in the tree stand at the wrong time of day. In general, a majority of deer movements are made during their feeding periods – just before and right at dawn as well as around sunset. Deer are nocturnal creatures, meaning they are most active between sunset and sunrise. They spend daylight hours sleeping. There is a lot of information online regarding deer movements and feeding habits relating to lunar phases. While the moon can have some effect on deer feeding patterns, it is our opinion that you’ll get better results relying on weather conditions over phases of the moon. 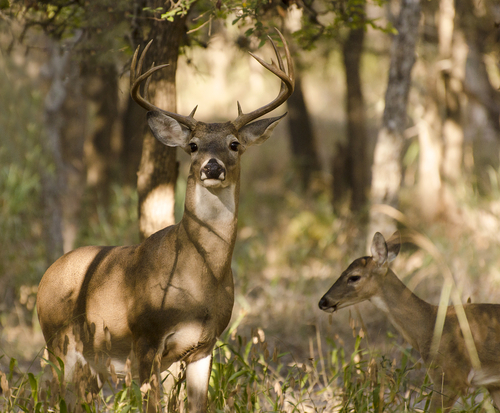 Research shows that deer prefer cooler weather – even in Texas – so anytime a cold front is predicted, get your gear ready and head out to your tree stand. Some hunters don’t realize the impact of even subtle human (and artificial) scents out in the wilderness. Chances are, after last year’s hunting season, you hung your hunting gear in your garage and that’s where it stayed for the next several months. You can’t go out in the woods with smelly overalls and flannels. A mature buck has an incredible nose. One sniff of your human scent and he will be evacuating the area ASAP. Wash your clothes with unscented detergent and store them in an air-tight, scent free bag. Shower with unscented soap just prior to a hunt, and use field spray. It’s even helpful to get dressed out in the field, if possible. Scent control could double your advantage. It’s been shown that most deer follow a three-day cycle. Hunters who move their tree stand after one or two days of not seeing any deer will go home empty-handed and frustrated. Just like most things in life, hunting requires some time and patience to be successful. You obviously don’t want to continue going back to a “dead” area if you never see anything, but don’t make the mistake of ditching a spot too early. Give it at least three days before you move to a new spot.